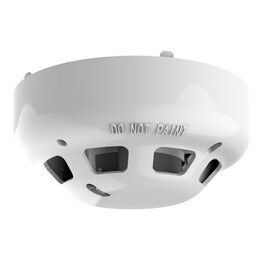 The SOC-E3N is a Photoelectric Smoke Detector, which is fully compatible with the majority of existing Conventional systems. The SOC-E3N incorporates Hochiki’s unique High Performance photoelectric smoke chamber removing the need to use Ionisation Detectors in the majority of applications. ‘AFVW’ Drift Compensation technology is incorporated to ensure the Detector is operating at its optimum sensitivity and therefore reducing potential false alarms. If the contamination limit is exceeded then the integral red LED will flash once every three seconds to give a visual warning. The smoke chamber is easily removed or replaced for cleaning and utilises a unique baffle design which allows smoke to enter the chamber whilst keeping out ambient light. Wide voltage range (9.5 ~ 30 V dc). Low profile design with one piece outer cover. Single fire LED - 360° viewing.